This species originates from North America. During the 1960s it began to appear in Europe and it has become common in the Nordic countries. The beetles are between 2 and 5 mm long. The front third of the beetle is black, while the rest is brown, with a light drawing on the front of the elytrons. The larvae are up to 6 mm long. They are hairy and brown. The hind has a long brush of golden hair. The reesa vespulae larvae are practically omnivorous. 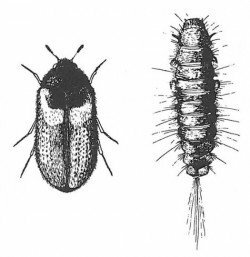 Reesa vespulae, adult and larva. In North America, where it is found in nature, it lives in bee hives and wasps’ nests. It feeds on dead insects, but it can also live on other dried animals and plants. 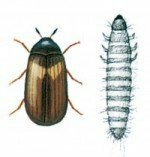 It can act as a pest in fruit storages. It rarely does any damage in private households. It lives hidden and eats crumbs, bird seed and dead insects. Males of this species have never actually been found and the females lay eggs that develop into larvae without being fertilised. Usually it takes the larvae a year or more to mature.